Welcome To The Bottom Of The Food Chain! BUYSOUNDTRAX Records presents the original soundtrack to KOMODO, featuring music composed by John Debney for the 1999 horror/thriller directed by Michael Lantieri, written by Hans Bauer and Craig Mitchell and starring Jill Hennessy (CROSSING JORDAN), Billy Burke (REVOLUTION, TWILIGHT) and Kevin Zegers. KOMODO was the directorial debut of Oscar-winning special effects man Michael Lantieri, predating the current trend of giant, mega and dino-sized creatures that currently terrorize us on sea, sky and land. Lantieri brought in Phil Tippett, both of whom had won special effects Oscars for JURASSIC PARK, to manage the computer graphics, and the John Cox Creature Workshop, in Australia where the film would be shot, to handle the animatronic lizards. The result is a nearly seamless blend of CGI, puppet heads and tails, and animatronic komodo that enhance the film without calling undue attention to the mix of effects. Filmed in Brisbane on Australia’s Gold Coast, production designer George Liddle built most of the sets on location. It was Lantieri’s film editor, Michael Fallavollita, who suggested his friend, John Debney, for the film’s score. Lantieri had met Debney earlier when he was working on Amblin Studios’ SEAQUEST television series, which Debney had scored. Debney had previously scored 1997’s THE RELIC, a monster film about a primitive reptilian creature roaming the Chicago Natural History Museum, and which serves as a close musical cousin to KOMODO. John Debney is considered one of the most sought after composers in Hollywood. His unique ability to create memorable work across a variety of genres, as well as his reputation for being remarkably collaborative, have made him the first choice of top level producers and directors. Debney combines his classical training and a strong knowledge of contemporary sounds to easily adapt to any assignment. In the tradition of classical composers, John Debney enjoys conducting his own work. "A big part of the joy in what I do is that I consider it an honor to stand in front of live musicians and have the opportunity to hear my music played by these talented people." In addition to conducting some of the world's greatest orchestras performing his original works, Debney has also conducted the Royal Scottish National Orchestra on a series of classic film scores for Varese Sarabande Records. He has been celebrated for incorporating a myriad of musical styles and techniques into his work, from contemporary beats to ancient instrumentation. 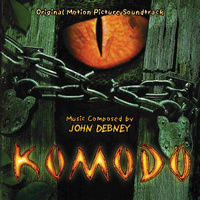 BuySoundtrax Records presents KOMODO, featuring music composed by John Debney. Long sought after by fans of the composer, KOMODO finally arrives on compact disc. The booklet contains notes by author Randall Larson, including participation from composer John Debney. Autographed by composer John Debney.